Joe and I met in our hometown of Johnstown, Pennsylvania. 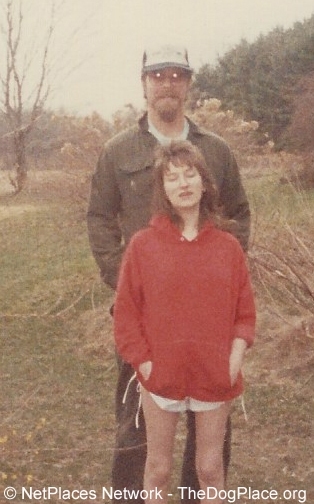 We met through our Dobermans in1982. 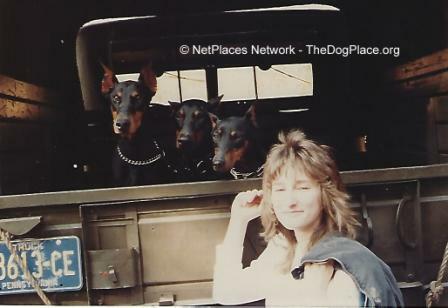 Joe was known for training Dobermans Pinschers and I was known for having one. 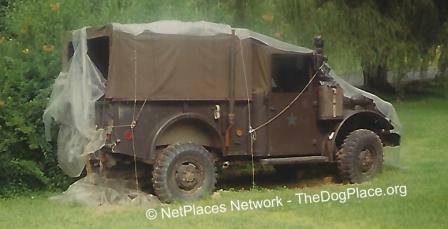 In 1985 we bought our home in the corn fields of Punxsutawney, PA. We quickly became the talk of the town with our 1963 Army Truck that often carried a pack of well-trained, friendly Doberman Pinschers. Joe soon became known for his skill at handling dogs and requests for dog training came fast and furious. By 1991 we had created and provided successful and innovative, non-food, group training classes. Our classes were highly sought after and soon dog owners who had been rejected from other classes were knocking at our door. We developed techniques to work with difficult dogs and their owners in class situations. In many cases after evaluating a troubled dog we would tell the owner, “The good news is the problem is not with the dog, the bad news is the problem is not with the dog!” The lives of many dogs were saved with this honest approach to training. In 1992 we organized the first Therapy Dog Group in our area. With people thirsty for education and pet activities, we created yearly events such as pet conventions and pet shows for the public. Through the years we have enjoyed providing obedience demos and canine education to thousands of school aged children. We have also provided obedience demos for the Girl Scouts, Boy Scouts, the Salvation Army, the Punxsutawney community center as well as local hospitals and Veteran’s clinics. We were invited to host various seminars for local rescue groups, new puppy buyers, feed mills and humane societies. We gave a talk and demonstration on pet therapy and canine behavior for the National Therapeutic Recreational Institute. There we had the opportunity to work with Doctors, nurses and administrators concerning safe pet therapy programs. To broaden our educational efforts we authored a doggy self-help newspaper column. The first column concerned a family with two fighting Labrador Retrievers. We titled that column “THE SILENCE OF THE LABS” and it was the spring board into writing dozens of articles for various canine periodicals in print and on Internet. We often demonstrate our dogs and/or speak for the media on behalf of dogs, most recently with our Dobermans on cropping and docking. 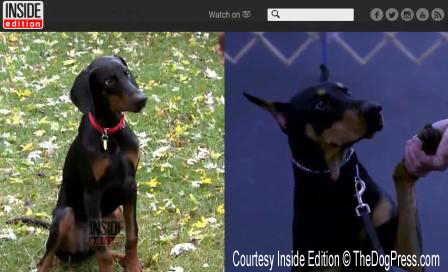 Our dogs have made many positive appearances on CBS, NBC, FOX and ABC newscasts. They have also appeared on the TODAY SHOW and on INSIDE EDITION. Joe’s experience as a morning show radio host led us into hosting a radio show for 3 years where we interviewed celebrities in the dog world. These included the President of AKC, legendary AKC judges, handlers and trainers including the Forsyths, Annie Clark and Captain Haggerty. We also created a video on therapy dog visiting, a copy of which is in the AKC Library. We participated in changes to the AKC Canine Good Citizen Program. It was through these actions Joe received the 2003 AKC the “Community Achievement Award”. Although now retired from training classes and event organizing for the public, we continue to be strong advocates to preserve the character and appearance of all breeds. We are especially concerned with maintaining the standard of the Doberman Pincher as it is today described in the AKC Breed Standard. We produced the first international dock/crop survey which resulted favorably for cropping and docking. We have rebirthed the NBCA (National Breed Clubs Alliance) establishing contacts within many of cropped and/or docked breeds. Breed clubs are apprised of possible interferences in their standards by the AKC. We encourage national (parent) breed clubs to proceed with caution when approached to change their standard under the pretence of “reformatting and clarification”. We became actively involved in the rebirth of the ADPEF (American Doberman Pinscher Educational Foundation), an organization created to educate the public about the AMERICAN Doberman Pinscher and its cropped and docked Breed Standard. Although currently enjoying retirement with our dogs, we continue efforts toward education and preservation of breed standards though TheDogPress.com, TheJudgesPlace.com and other social and educational sites. We are fortunate to have a following of thousands of readers and dog professionals through these outlets. 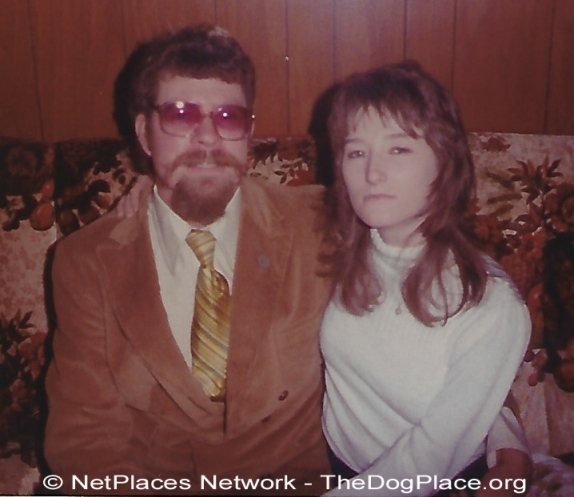 Our relationship came about from “making puppies” which led us to preserving breeds and their standards. This adventure has brought us to you. Thank you for caring about the purebred dog! Inside Edition interview goes national on media outlets. By and for people who shape the sport of dogs! See what makes a Working Certificate possible!